Food is not always something that you put in your mouth and eat! Woo Hoo, I can fly! The Girls have grown and are discovering that they have wings. They now take off running flapping their wings and become airborne……… slightly. It’s quite comical. I wonder if this is what the Wright Brother’s looked like when they were trying to fly an airplane for the first time. We doubled their living space this week because they out grew the brooding area they started off in and need a little more room. Although we plan to keep the Girls in this space for a week I don’t think it will last that long. They are already perching on the feed lines and it won’t be much of a stretch for them to reach the top of the partition and hop over to the other side. The livability (none dying) is unbelievable. These chicks are hardy! 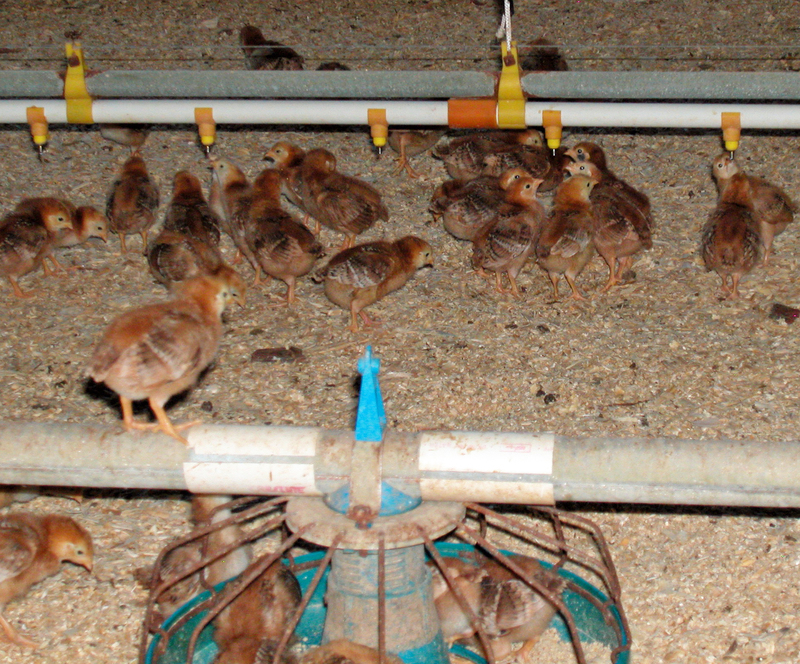 When raising industrial chickens it was nothing to pick up at least 100 dead chicks per day per chicken house. 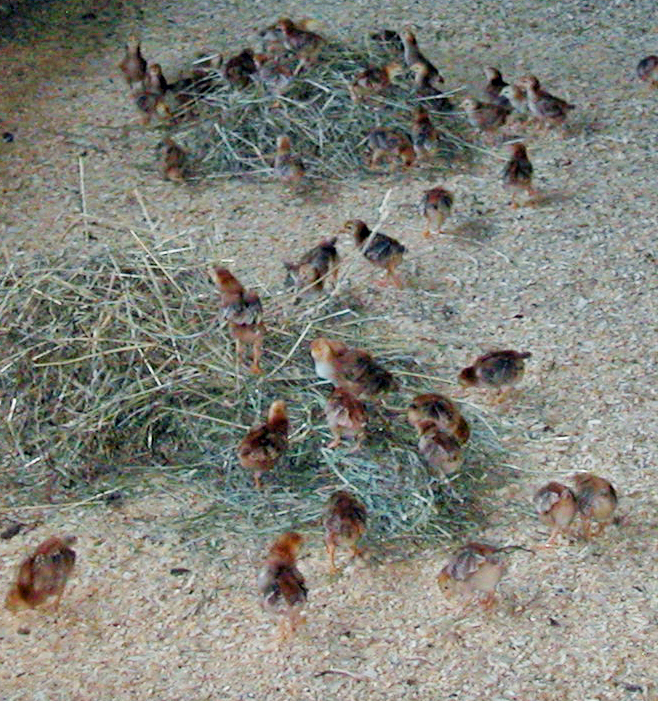 Every day I expect to walk into the chicken house and find dead chicks and every day I can’t even find any that look like they might die. It’s exhilarating and I’m going to have to retrain my brain. I’m thinking that not only transitioning the farm from industrial to pasture raised that mindset is in need of transitioning as well. The Girls scratch around in the sawdust constantly as if they are foraging and peck at everything! A friend suggested that we hang a head of cabbage on a string from the ceiling to allow them to peck at it. We decided to hang a head of cabbage and a head of lettuce and also introduced them to grass clippings and hay. While children don’t like to eat their veggies, baby chicks have no problem doing so. The Girls devoured the head of lettuce within 2 hours and the grass clippings were next. They mildly pecked at the cabbage however the hay didn’t stand a chance. It was really strange adding things to the chick’s diet and at one point I questioned my husband about being sure that we should do it. Again, that mindset needs a transition. I’m still stuck back in a time when we were never allowed to feed anything to the chickens except what the company brought us. I find myself making comparisons between our little red hens and industrial chicks. “Amazed” is the best word I can find to describe their differences in every way. I’m constantly amazed at how our Girls know exactly what to do. Humorously, my son says that the industrial chicks have” mental issues” because their genetics have been mixed and matched so much that their brain has been genetically bred out of them! I’m beginning to wonder if he might have a valid point in his humor. It’s a pleasure going inside the chicken house to see our Girls. There’s nothing better than being able to see without using a flashlight. We have dark out curtains on the chicken house, a remnant from the demands of the industrial days, but have installed a strip of clear poly, like a skylight, to allow sunshine into the building. Our plans are to replace the dark out curtains with clear curtains so that there is plenty of sunshine coming in. The industrial company demand for dark out curtains is to keep the chickens docile so that they don’t waste energy moving around. The theory is that they convert feed to pounds of meat faster. We want our Girls to have plenty of sunshine, be active like little kids, and to grow naturally not to be force fed and inactive like couch potatoes. If the Girls make it for a week in their new expanded area without escaping we will turn them loose into the entire space within the chicken house. They will each have 6 square feet inside. There is still much to do in transitioning and as our Girls grow the list gets longer. Although it’s a lot of work, and I hesitate to say the word fun to all of you, I’ll say it anyway. It’s FUN! Name, Email, URL are optional when leaving a comment Comments are most welcome and discussions should be lively however the right is reserved to not publish comments which are socialy unacceptable.